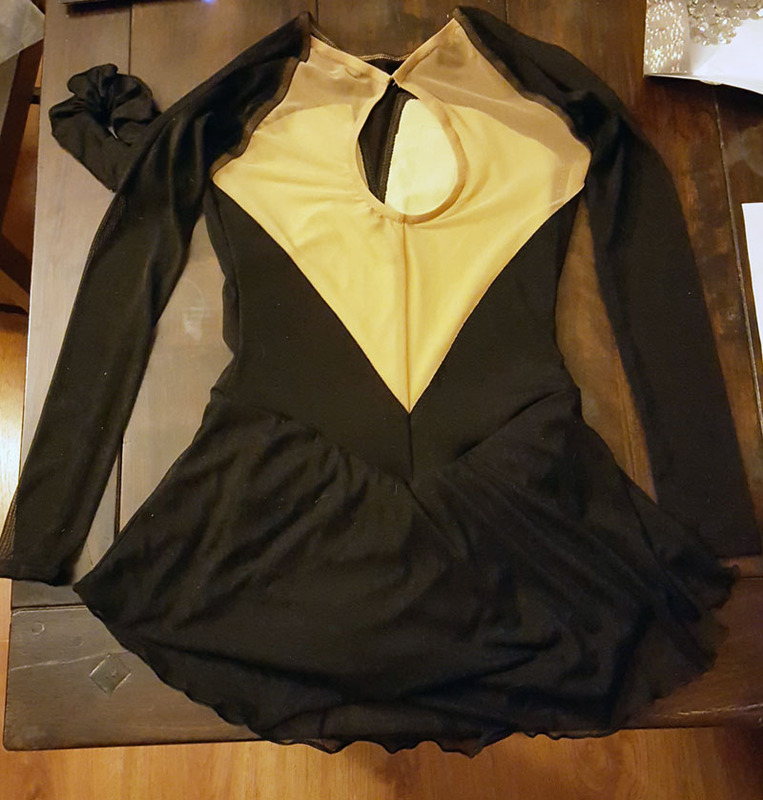 What I did differently this time than the last time I stoned a dress was swapping some materials. I switched to that industrial-grade E6000 glue, which definitely smelled toxic but seemed strong and secure once dry — these crystals aren’t going anywhere! I also upgraded to real crystals, after having used plain acrylic ones in my first try. In retrospect it would have been nice if I’d sprung for the good stones the last time, since the real crystals do look much nicer, but I don’t regret making that choice because it felt safer to start with a modest project and small budget when I didn’t know anything. 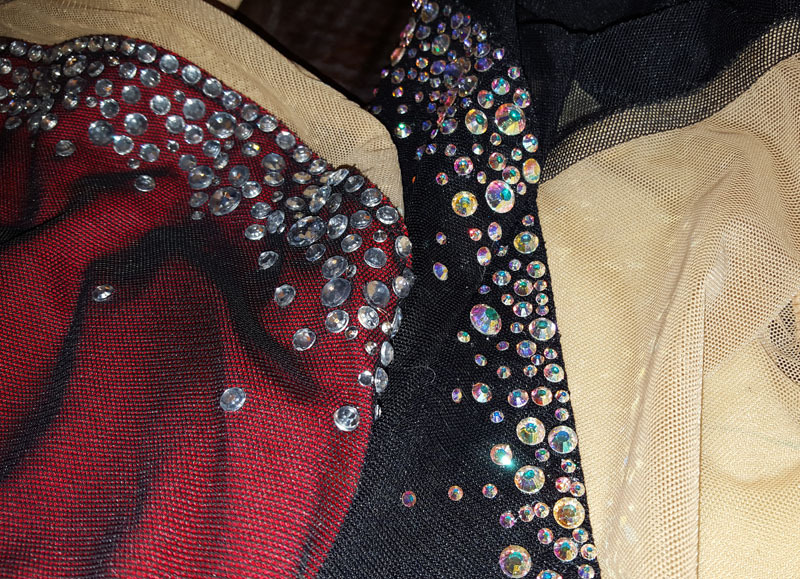 Here’s a comparison of the old dress (red) with acrylic gems, and the new one (black) with real crystals. If you click to see the enlarged image, you can really see the quality difference. I bought about a thousand AB crystals in a few different sizes, which cost probably close to $150. I didn’t use them all, so there are leftovers for another project, but I did use A LOT. I debated between the standard foil-backed crystals and the AB ones, which have more color when they sparkle under the lights, and am pleased that I went for the AB. Here the pattern’s starting to emerge — mostly medium-sized crystals (I want to say they were 20ss; I bought the most of that size), with some larger ones scattered throughout (40ss and 48ss). No science to it; just eyeballing what looked good. 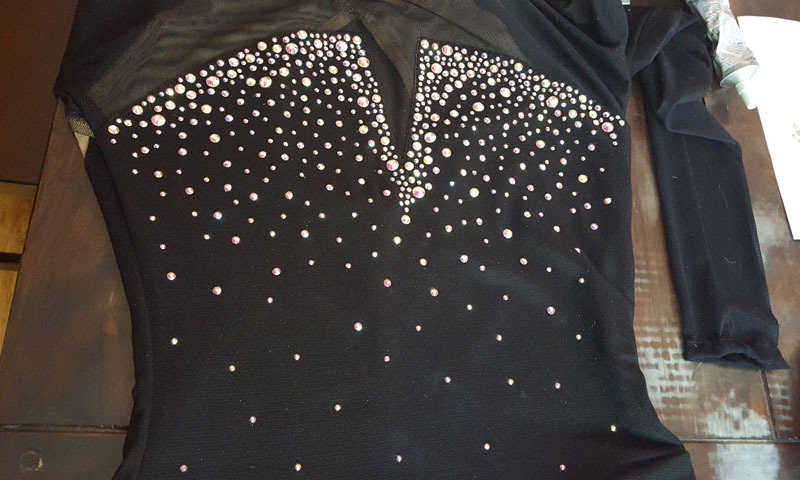 I found that it made things look a touch nicer to fill in blank spots with a lot of tiny crystals — the 5ss size — so despite the tedium of painstakingly gluing on those tiny suckers, they really added a nice touch. Next time I’m buying more of those. I used the same stoning pattern for the wrists, so that it looked sort of like chunky bracelets when wearing the dress. The white paper in the sleeves are pieces of parchment paper, so that I could glue the stones on without the glue bleeding through to the other side. 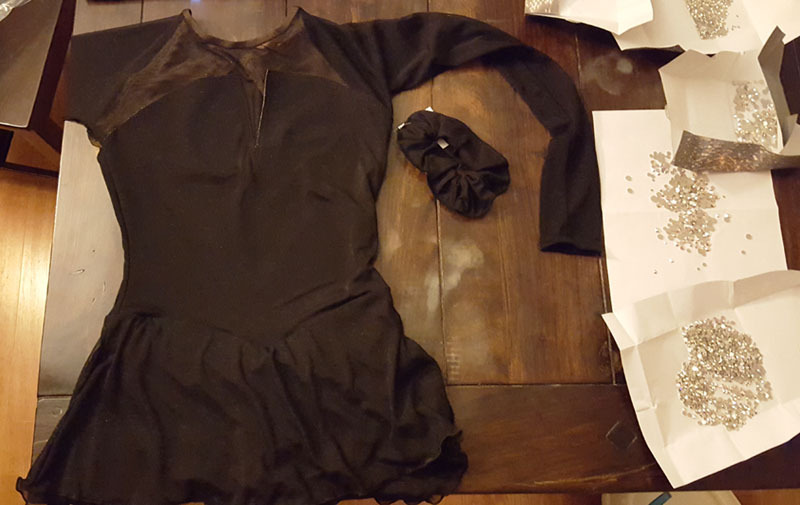 Having the sleeves glue shut would not have been awesome! And here’s the final product! You can see it in motion in my sectionals freeskate video. Beautiful, Sarah! I really like the mix of larger and smaller stones–really accents the motion of skating. The real AB crystals do make quite a difference, too; worth the extra cost, especially since you are putting so much time and energy into the project. Light on! Yes, it was SO worth the extra cost! 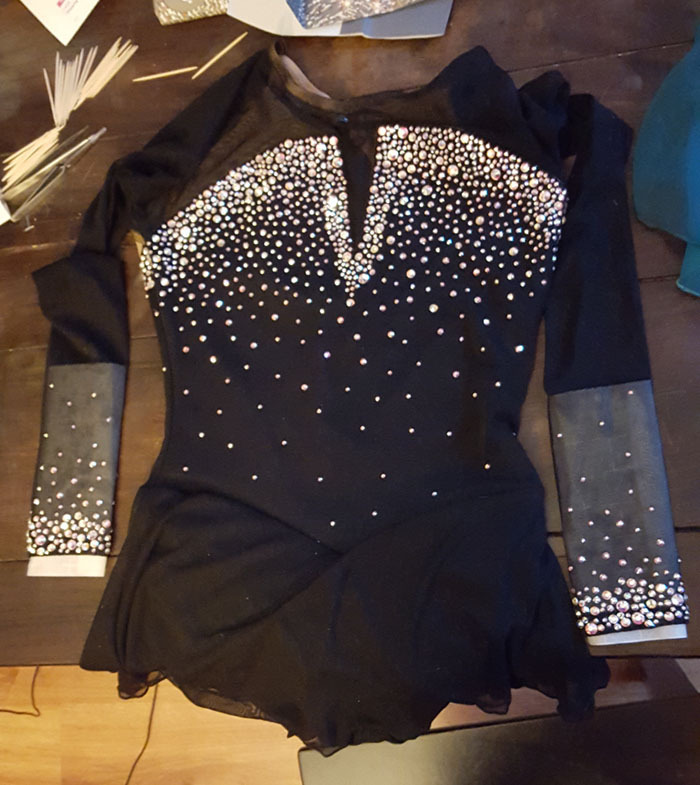 I saw so many beautiful costumes at Sectionals that it gave me more ideas for mixing stones and patterns, so I hope the next one will be even better! This is beautiful! It looks really professional! The dress is amazing. 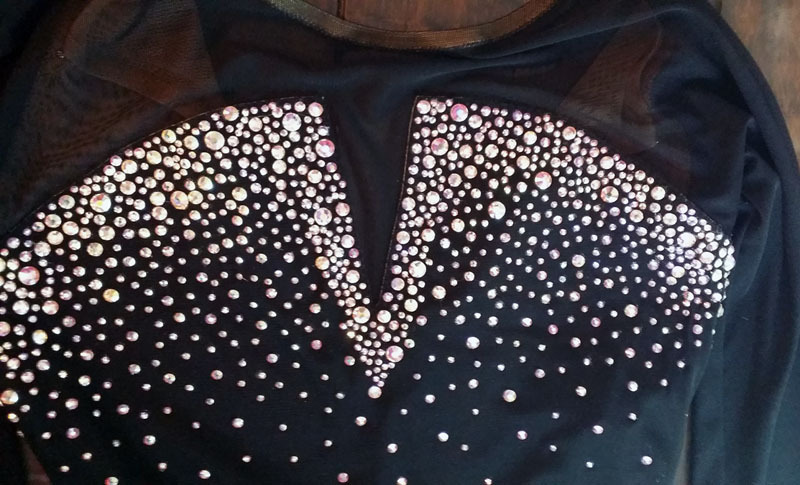 Are you looking for anything new, more specific, more glamorous for your next competition? I took my time so it definitely added up to a number of hours! I would estimate maybe 8 or more total, but I broke them up over several consecutive days. Partly to give glue to dry and assess before adding another set of stones, and partly to break up the monotony—I enjoyed the stoning process, which was kind of meditative actually, but worked in maybe 2-hour chunks. 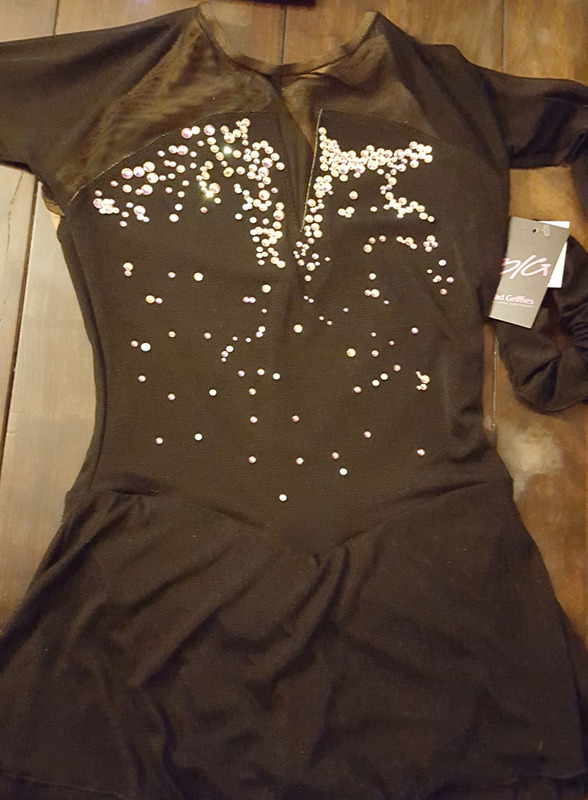 Good luck with your dress!! Thanks for sharing Useful information. i appreciate your blog. Keep Sharing!